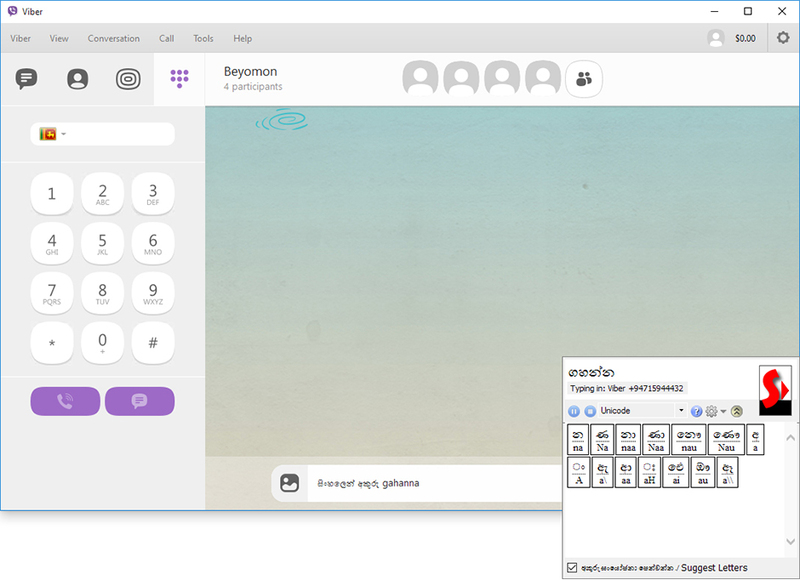 "Sinhalata" is a Software developed to type Sinhala anywhere on your computer (Skype, Facebook, Word, Notepad, Excel, Viber etc.) with less effort. You can type Sinhala words as it sounds using the English Keyboard with our Sinhalata software and it will translate it to Sinhala script. For instance, if you want to type "මම", what you have to do is type "mama" and then it will convert it to the Sinhala word. 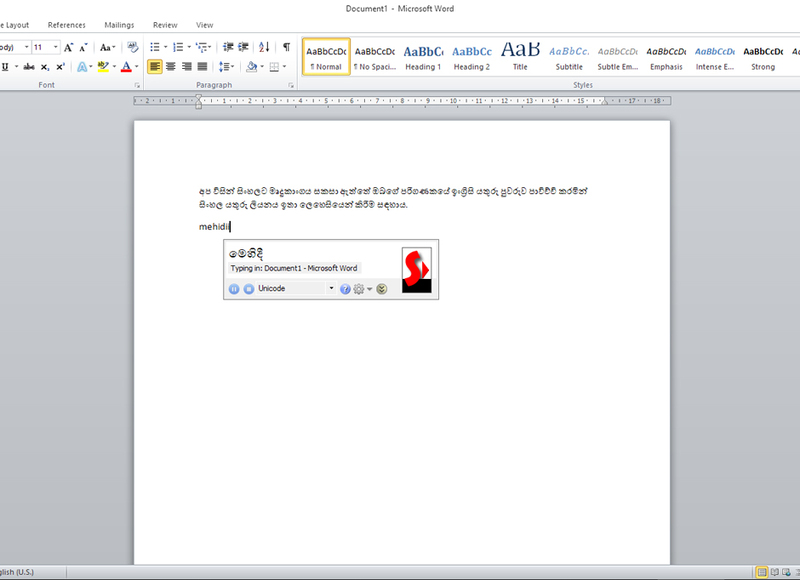 Furthermore as you type the first English letter of the Sinhala sound it will either show you a list of letters that you can see how to type or show you a list of sinhala words that you can chose to complete with. If the word is not in the list, it will get added automatically so that you have the word next time in the list. To make it simpler you can use different Fonts without knowing what Sinhala keyboard layout it uses. අප විසින් සිංහලට මෘදුකාංගය සකසා ඇත්තේ ඔබගේ පරිගණකයේ ඉංග්‍රීසි යතුරු පුවරුව පාවිච්චි කරමින් සිංහල යතුරු ලියනය ඉතා ලෙහෙසියෙන් කිරීම සඳහාය. මෙම සිංහලට මෘදුකාංගය ඔබට අවශ්‍ය ඕනෑම තැනක (Skype, Facebook, Word, Notepad, Excel, Viber etc.) සිංහලෙන් (Unicode අකුරු වලින්) ලේඛණය කිරීමට ඉඩ සලසන අතර සිංහල අකුරු භාවිතා කර අනෙකුත් MS Word, MS Excel, MS PowerPoint වැනි වැඩසටහන් වල ලේඛණය කිරීමට හැකියාව සලසයි. මෙහිදී ඔබ කළ යුත්තේ සිංහල වචන ශබ්දවන ආකාරයටම එය ඉංග්‍රීසි අකුරුවලින් ටයිප් කිරීමය. උදාහරණයක් ලෙස "මම" යන වචනය ටයිප් කිරීම සඳහා එය ශබ්ද වන ආකාරයෙන් "mama" යනුවෙන් ටයිප් කළ යුතුය. සෑම වචනයක්ම අවසානයේ ඉංග්‍රීසියෙන් ඇති වචනය සිංහල වචනයට පරිවර්තනය වෙනු දැකිය හැකිය. මෙහිදී භාවිතය වඩාත් පහසුවන පරිදි අකුරු සංයෝජනාද, ඊට අමතරව වචන යෝජනාද එම අවස්ථාවේම ලබාගත හැකිය. අදම සිංහලට මෘදුකාංගය නොමිලේ බාගත කරගෙන ඔබගේ ලේඛණ කටයුතු ඉක්මන්ව හා පහසුවෙන් කරගන්න. MS Word, MS Excel and MS PowerPoint etc. Gmail, Yahoo, Live Mail or even email clients such as Outlook and Thunderbird etc. Get suggestions for the next letter and even words as you type. 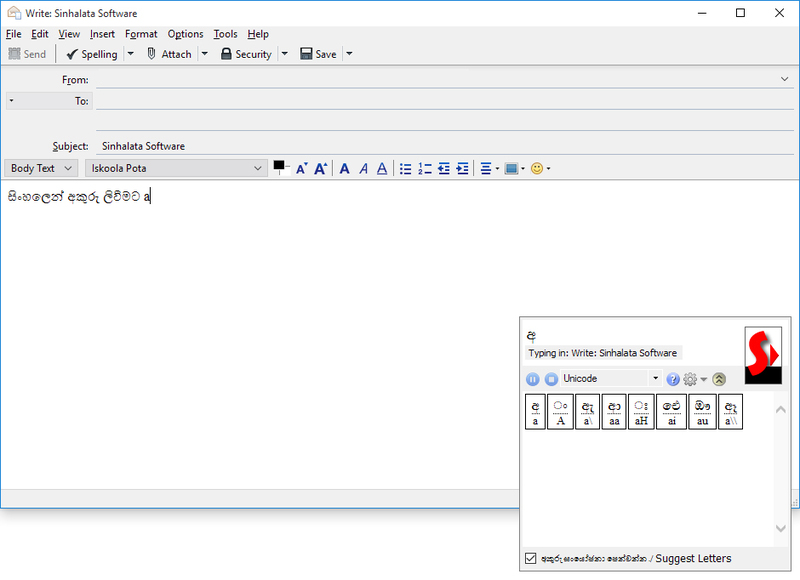 Use Unicode or different Sinhala fonts that you already have. HDD Free Space: 512MB හෝ ඊට වැඩියෙන් තිබිය යුතුයි. V1.0 සඳහා PatchInstaller.zip අන්තර්ජාලයට ලිපි සැකසීමට භාවිතා කරන Unicode Font සඳහා අවශ්‍යවන "Unicode" Font Map සමඟ "Ananda", "DL-Araliya", "FMDerana" හා "Su_MADURA2" Font Maps මෙහි අඩංගු වේ. භාවිතා කිරීමෙන් අනතුරුව ඔබට මිලදී ගැනීමට අවශ්‍ය නම් පහත පියවර අනුගමනය කරන්න. 1. පළමුව පහත දැක්වෙන බැංකු ගිණුම වෙත ඔබගේ ගෙවීම කරන්න. විස්තරය: ඔබේ බැංකු ගෙවීම්පතෙහි ඔබේ ජා. හැ. අංකය හෝ විදේශ ගමන් බලපත්‍රයේ අංකය හා දුරකතන අංකය අනිවාර්යෙන්ම සඳහන් කරන්න. 2. දෙවනුව වැඩසටහන ක්‍රියාත්මක කරන්න. අනතුරුව Sinhalata 3.1 එහි Help Menu එකෙහි ඇති Register නම් Sub Menu එක මත Click කරන්න. 3. පෙන්වන Window එකෙහි ඇති Copy බොත්තම ඔබා දී ඇති තොරතුරු පරිඝණකයේ මතකයට ගෙන ඔබ භාවිතා කරන Email වැඩසටහන පාවිච්චි කර එහි කර ඉහත සඳහන් කළ ඔබේ නම, ජා. හැ. අංකය හෝ විදේශ ගමන් බලපත්‍රයේ අංකය හා දුරකතන අංකය සමඟ මඟින් එවන්න. ඔබේ Product Key එක ඔබට පැය 24ක් ඇතුලත Email මගින් ලැබෙනු ඇත. 4. ලැබුණු Product Key එක භාවිතා කිරීම සඳහා ඔබ එය පමණක් පරිඝණකයේ මතකයට Copy කරගතයුතුයි. 5. දැන් ඔබ සිංහලට වැඩසටහන ක්‍රියාත්මක කර එහි Help Menu එකෙහි ඇති About Sinhalata Sub Menu එක මත Click කරන්න. 6. පෙන්වන Window එකෙහි Product Key සඳහා ඇති තැන Paste කරන්න. 7. සම්පූර්ණ කිරීමට සිංහලට වැඩසටහනෙන් ඉවත් වී නැවත ආරම්භ කරන්න. 3. පෙන්වන Window එකෙහි ඇති Email බොත්තම ඔබා එහි ඇති තොරතුරු ඉහත සඳහන් කළ ඔබේ නම, ජා. හැ. අංකය හෝ විදේශ ගමන් බලපත්‍රයේ අංකය හා දුරකතන අංකය සමඟ Email මඟින් එවන්න. ඔබේ Product Key එක ඔබට පැය 24ක් ඇතුලත Email මගින් ලැබෙනු ඇත. Please contact us from the following contact form for your comments and requests. Copyright © 2017 www.sinhalata.com | All rights reserved.